Thank goodness Convergence is over, now it’s time for the real goodness to begin, and the new DC (what are we calling it now?) kicks off with a bang with Justice League #41. Darkseid War brings a couple of the biggest DC villains against the biggest DC superheroes, and really it’s quite glorious. So let’s discuss Justice League #41! So here’s what we know so far: Darkseid is back. The Justice League first formed in the beginning of the New 52 to defeat Darkseid. After overlooking his strategy again he’s decided to give it another crack, you know the whole making Earth his own and everything. And with Darkseid are his allies Lashina and Kanto. Surprisingly we find out that Lex Luthor’s sister is evil. Well I guess that shouldn’t have been that big of a surprise, but I didn’t see it coming! So we’ll call them “Team Darkseid”. 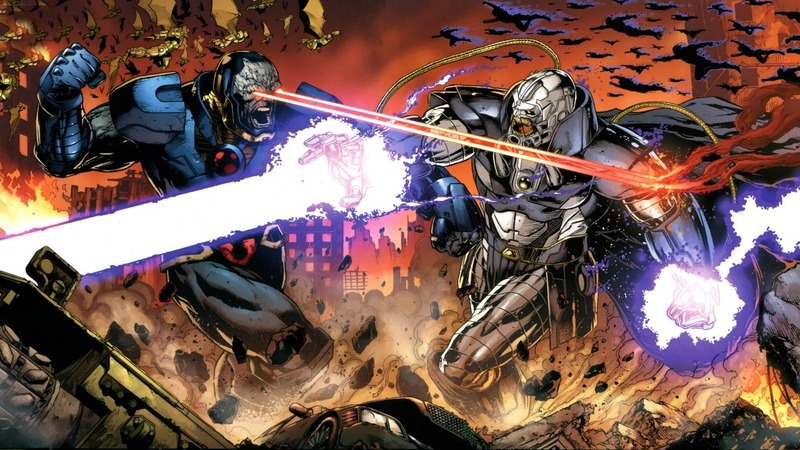 Now we know that Darkseid War will have a face-off between Darkseid and Anti-Monitor. Anti-Monitor is the one of course that caused that Crisis and was the one who destroyed Earth 3. Anti-Monitor and Darkseid are not friends (which you think they would be, because they seem like dudes with similar interests), the exact reason for that hasn’t been revealed yet I don’t think. With Anti-Monitor is Grail, Darkseid’s daughter. She’s also the daughter of an Amazonian assassin, so she’s probably not a pleasant gal. Grail was born on the same day as Wonder Woman, so clearly we’re going to be seeing a lot of interaction between them. The dichotomy of good and evil, lightness and darkness is clear between Grail and Diana. 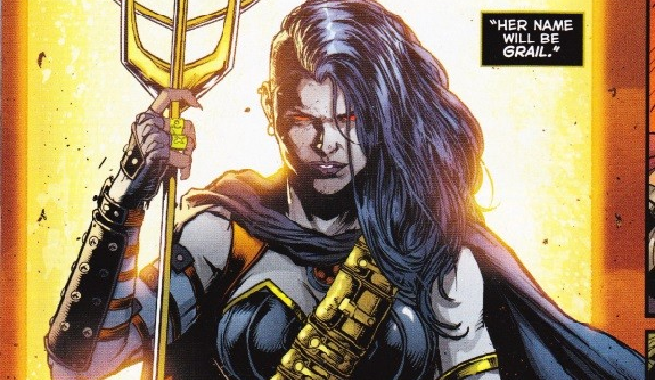 Also on Team Anti-Monitor is Grail’s mother, Myrina Black. And a new potential member of Team Anti-Monitor could be Mister Miracle, but we’ll see how that goes. So there’s a war going on and the Justice League seem to be caught in the middle of it. 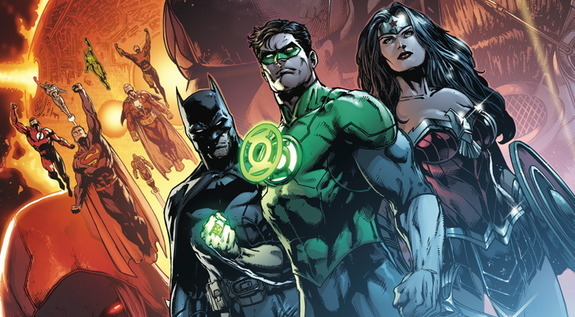 Jason Fabok does a wonderful job capturing the pure greatness of the Justice League. The panels with them pondering what’s out there were really well done. But as Diana said, the Justice League aren’t really gods. It’s easy for them to give off the perception of flawless, indestructible gods, but they’re not. And Grail proved that, taking them down like a complete badass. She’s not stupid, and has studied up on the League. As the for the League dynamics themselves, I love the relationships Geoff Johns showcases. From detectives Barry and Bruce, to one of my favourite Justice League friendships, Shazam and Cyborg, he really makes them seem like a team. They all have their role to play, and they all work together well. Even though they may seem like gods, they need each other. It’s also great to see Wonder Woman out front and centre in this issue. Grail directly connects with her and her people. One of the most interesting parts of Wonder Woman for me is her balance between two polar opposite forces. Wonder Woman is a warrior of war, yet also an ambassador for peace. It’s her responsibility to find the right balance between those two forces. So how does she keep that balance when war and destruction personified attack her and her world? It will be great seeing Wonder Woman’s character grow with this event. Away from the rest of the League in Justice League #41 was Superman. It’s always great to see Supes and Lex hanging out. Superman will never trust Lex, and Lex will always feel insecure around Superman. It was funny to see him freaking out when Supes undermined him in front of his sister. His sister of course could not care less, being on Team Darkseid and all. But it will be interesting seeing Superman and Lex’s relationship grow, as they battle his sister together. Justice League #41 was a great set-up to all the epicness that’s about to begin. The issue was about introducing all the main players, and setting the pieces in motion. But what will Darkseid War show us? It will show us that the Justice League aren’t gods, but have power and force worthy of the gods. That there are forces in the world much bigger than them. It will show us what happens when evil comes head-on with good. Darkseid War is looking to be quite the epic event, let’s hope all the hype pays off. Justice League #41 is out now written by Geoff Johns with art by Jason Fabok (who draws an amazing Wonder Woman I must say) 9/10. Do we even care who plays Spider-Man at this point? DC Cinematic Universe: Are we feeling more confident with it now? Wait, what about Mister Miracle? I love that guy! Explain! I… might actually have to read this then. Thank you! Haha well if you’re a fan of Mister Miracle then I would definitely recommend checking out the arc! Is this Bruce Wayne Batman despite Jim Gordan robo-Batman being the Batman other places? (Batman and Superman/Batman at least)? Darkseid is one of my favourite villains! This will be a great run for the Justice League. I hope they’ll use Darkseid as villain in one of the two Justice League movies. Absolutely! Although with Marvel already using Thanos it would be kind of odd-looking… although I think Darkseid was first… still though, I want to see some New Gods on screen! 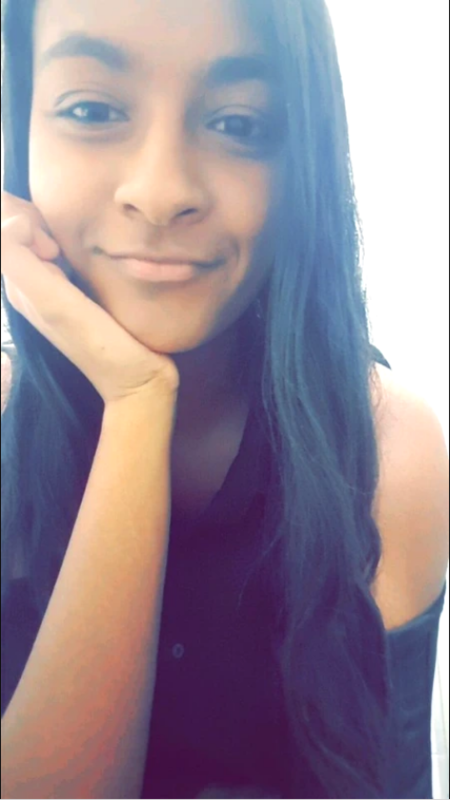 So in my opinion, totally worth the weird looks. The story is pretty good, but also confusing. Justice League #40 and Divergence #1 establish that all the multiverse shenanigans are still canon and only certain characters are aware of them, like Metron, Anti-Monitor, and possibly Darkseid. Before New 52, the New Gods died and reincarnated and Anti-Monitor was almost Galactus-size, so I’m guessing that since New 52 happened, the New Gods here are the reincarnated versions and Anti-Monitor just decided to change himself. As for why he’s going after Darkseid, I think it’s just because in Crisis on Infinite Earths, he didn’t get to conquer him so I guess he’s just settling an old score. That’s just my opinion on it.